Some companies say they honor fathers, others put their money where their mouth is: T-Mobile has announced a new Father’s Day promotion for a year of free or discounted data. To be eligible, you or your dad need to be a new customer or an existing subscriber (with 18 months or more of your contract completed). If you sign up or renew for a qualifying unlimited talk, text and data plan on Saturday, June 18, you’ll get the 200 MB data free for a year. If this tier doesn’t cut it, you can snag a 2, 5 or 10 GB plan (or an eligible two-year mobile broadband plan), and Tmo will still knock $10 off per month. This promotion is for one day only, so if you’re interested, be sure not to miss it. For more, hit up T-mobile.com or check out the press release below. BELLEVUE, Wash. — June 14, 2011 — In honor of Father’s Day, T-Mobile USA, Inc. is celebrating, once again, with a compelling offer that will reward customers all year long. On Saturday, June 18, for one day only, customers who sign up for a new qualifying talk, text and data plan will get 12 months of free data. That means customers will be worry free when surfing the mobile Web, staying in touch with friends via social networking, or checking their email. And, with a growing portfolio of affordable 4G smartphones to choose from, families can find the perfect gift for dad — or themselves — this Father’s Day while saving money and staying connected on America’s Largest 4G Network™. The Father’s Day free data offer is available to new customers and existing customers with 18 or more months of contract tenure who purchase a qualifying unlimited talk, text and data plan, including 200 MB of high-speed data, on a two-year contract. These customers will enjoy $10 in monthly bill credits for a year — equal to the price of the 200 MB data plan — for a total savings of $120. Alternatively, customers can choose from T-Mobile’s other unlimited talk, text and data plans, including the 2 GB, 5 GB or 10 GB high-speed data plans — all featuring no overages fees — and receive the $10 credit on their monthly bill for 12 months. In addition, customers who activate a qualifying mobile broadband plan on a two-year contract can also receive a $10 credit on their monthly bill for 12 months. Information about these plans, the T-Mobile 4G Mobile Hotspot, the 4G-enabled T-Mobile G-Slate™ and other mobile broadband products can be found online in the mobile broadband section of T-Mobile.com. 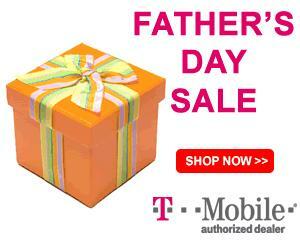 The Father’s Day promotion is available nationwide on June 18 at participating T-Mobile retail stores, national retail operators and online. More information about the offer is available at T-Mobile’s deals site and information about T-Mobile’s new unlimited plans is available at T-Mobile.com.